Management Trainee (Production) [27 Posts]: General: B.Sc.(Agri.) plus MBA (Agri. 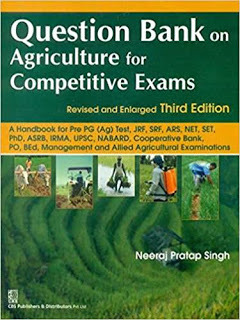 Business Management) OR M.Sc.(Agri.) with specialization in Agronomy/Seed Technology/Plant Breeding & Genetics/Agriculture Entomology/Plant Pathology. Management Trainee (Marketing) [9 Posts]: B.Sc. (Agri.) plus MBA (Mktg./Agri. Business Management) full time or Two years Full time PG Degree/Diploma in Marketing/Agri. Business Management OR M.Sc. (Agri.) from a recognized University/Institutions with minimum 60%* marks. Knowledge of Computer (MS Office) is mandatory. Management Trainee (Agri.) Engineering [3 Posts]: BE/B.Tech.(Agri. Engg.) from a recognized University/Institute with minimum of 60%* marks. Knowledge of Computer (MS Office) is mandatory. Sr. Trainee (Marketing) [48 Posts] : B.Sc. (Agri.) plus MBA (Mktg./Agri. Business Management) full time or Two years Full time PG Degree/Diploma in Marketing/Agri. Business Management OR M.Sc. (Agri.) from a recognized University/Institutions with minimum 55%* marks. Knowledge of Computer (MS Office) is mandatory. Sr. Trainee (Agriculture) [18 Posts]: Agriculture: M.Sc.(Agri.) with specialisation in Agronomy / Seed Tech. / Plant Breeding & Genetics / Agriculture Entomology / Plant Pathology. Plant Protection (PP): M.Sc (Agri.) with specialisation in Plant Pathology. Seed Protection (SP): M.Sc (Agri.) with specialisation in Agriculture Entomology. With minimum 55%* marks from a recognised University/Institution. Knowledge of computer (MS Office) is mandatory. Sr. Trainee (Quality Control) [2 Posts] : M.Sc (Agri.) with a minimum of 55%* marks from a recognized University/Institution with specialization in Genetics/Plant Breeding/Seed Technology. Knowledge of Computer (MS Office) is mandatory. Sr. Trainee (Horticulture) [3 Posts]: M.Sc (Hort.) /M.Sc (Agri.) with specialization in Horticulture from a recognized University/Institution with minimum 55%* marks. Knowledge of Computer (MS Office) is mandatory. Agriculture Engineering [8 Posts] Three years Diploma in Agriculture Engineering / Mechanical Engineering with minimum 55%* marks from a Govt. Polytechnic/Institution**. Knowledge of Computer (MS Office) is mandatory. Trainee (Agri.) [27 Posts]; B.Sc. (Agri.) with minimum 60%* marks from recognised University. Knowledge of Computer (MS Office) is mandatory. Note: All above essential and additional educational qualification must be of full time Course/Degree/Diploma from a reputed Institution/University for Direct Recruitment and must be completed before the date of closing of online application. 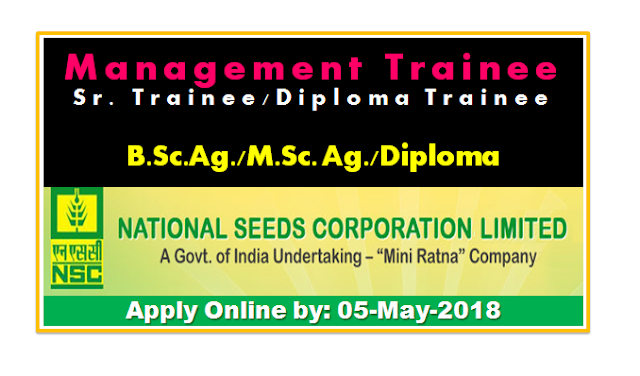 How to Apply: The interested and eligible candidates can visit www.indiaseeds.com for applying Online Application and for other details, no other mode of application is acceptable. The link for online application will be kept open between 11:00 Hrs on 14/04/2018 till 17:00 Hrs on 05/05/2018. The candidates are required to upload his/her recent coloured photograph, signature and attested/self attested copies of certificates/testimonials as per instructions given in the link.